We Talk To Tulio Galinda At Fortnum & Mason’s 45 Jermyn St. 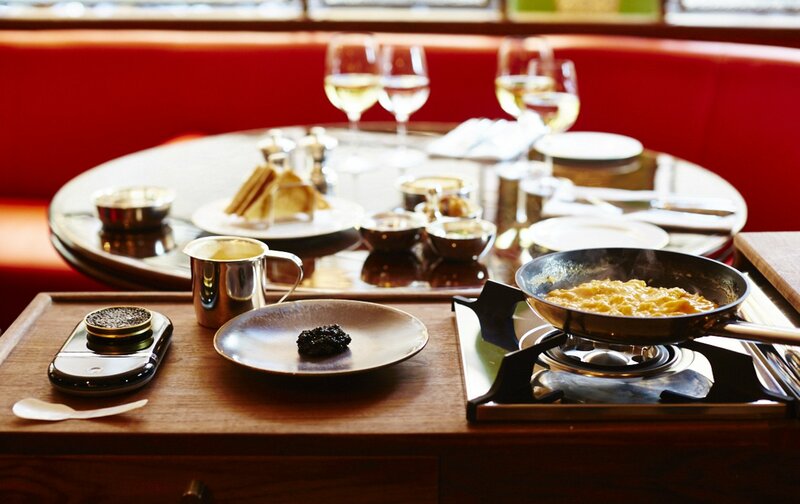 The caviar trolley with scrambled eggs, made-to-order. Photo: 45 Jermyn St.
At London Perfect, we have a penchant for Fortnum & Mason, the legendary brand. The epicurean’s dream department store with its luxury hampers and fanciful afternoon teas is the home for gorgeous, quality goods. A royal supplier, Fortnum’s holds warrants from HM The Queen and HRH The Prince of Wales. 45 Jermyn St. is the handsome fine dining establishment which is part of the landmark store, offering a suitably swoonsome experience. A quick history lesson: the company started back in 1707, with Hugh Mason’s tiny shop in St James’s Market. Hugh’s spare room was occupied by William Fortnum, who was a footman at Queen Anne’s residence and once the pair united – a new brand was born. It’s said that at the Queen’s household, new candles were requested every night, which meant that there was lots of leftover wax and Fortnum & Mason were finally in business. And a booming business it has become, with a very British legacy. A fun fact: in 1886, a prominent American (Mr Heinz) gave the store samples of his beans, offering the UK its first taste of what became a household staple. 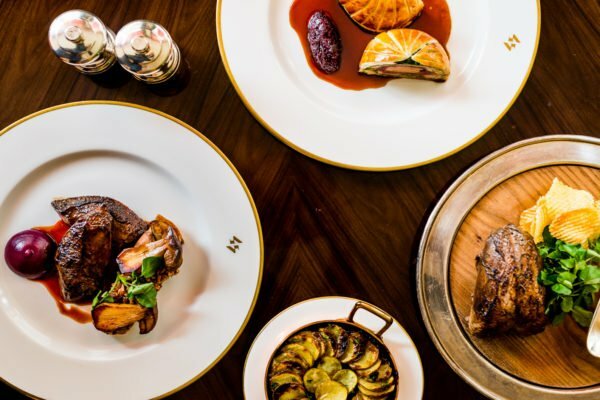 45 Jermyn St. is sophisticated and design-led and diners can expect old-world glamor with a modern twist. The upmarket brasserie has a considered menu with some special touches in the restaurant itself, such as the impressive caviar trolley. An added bonus is it’s located a short distance away from the shopping belt, the West End and some of our luxurious London residences now on sale. 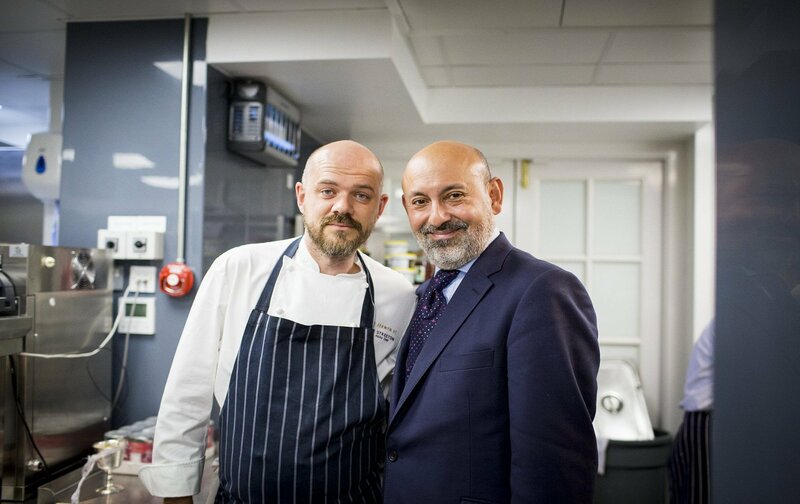 We spoke to General Manager, Tulio Galinda about life at 45 Jermyn St.
Tulio Galinda, General Manager (right). Photo: 45 Jermyn St.
Can you tell us more about Fortnum & Mason? Hugh Mason and William Fortnum started the business back in 1707. The first things we sold were the half-burned candles from the royal household of Queen Anne. So began the Fortnum’s story and our long history with the royal family. How would you describe the Fortnum’s philosophy? We’re home to joy-giving things, extraordinary experiences, and exceptional service and we exist to deliver a sense of pleasure to our customers. We’ve been here for three centuries, and in all that time, we’ve always been bold, creative and innovative. That means we’re never in thrall to our history but constantly inspired by it and not many brands can say that. Old-world glamor at 45 Jermyn St. Photo: 45 Jermyn St.
How long has 45 Jermyn St. been established? We opened in September 2015, but it feels like we’ve always been a part of this incredible neighborhood. The time has flown by! We have warrants from both HM The Queen (awarded in 1955) and HRH The Prince of Wales (awarded in 1996) and we’re very proud of them. Our design is a blend of classic and contemporary London and we recently won ‘Best Interior’ at GQ’s Food & Drink Awards 2017. What do you enjoy the most about 45? The variety of every day; the continued passion of my colleagues; our customers from all over the world. The menu is a combination of familiar favorites and surprises that are always inspired by the season, and are always made with outstanding ingredients, great creativity, and innovation. Cornish mackerel tacos. Photo: 45 Jermyn St. Which dishes are popular now? 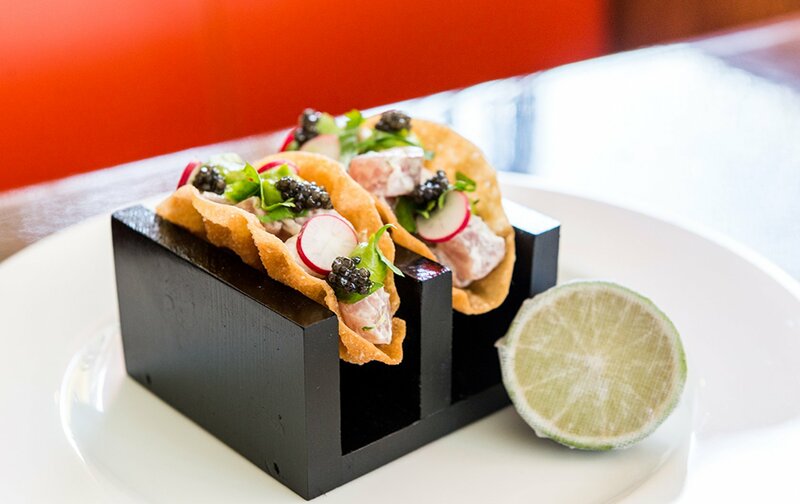 Caviar from our roving trolley is always hugely popular, but a more recent favorite would be our Cornish mackerel tacos. They’re fresh, pleasingly different, and absolutely delectable. What would you recommend for a special occasion? I’d suggest a trip through the floors at Fortnum’s, starting at the basement food hall, and finishing with afternoon tea in the Diamond Jubilee Tea Salon on the 4th floor. Then, a stroll around London’s streets, shopping or just taking in the hustle and bustle of one of the world’s great cities. Finally, dine at 45 Jermyn St. starting with a fancy cocktail or two from our exciting list. What could be better? 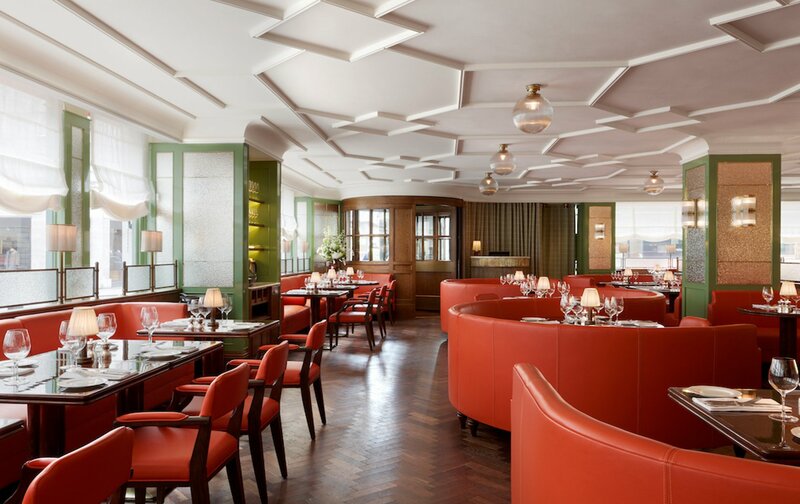 Make a reservation at 45 Jermyn St. on your next London trip, one of the hottest tables in the heart of the capital. For your next stay in London, our friendly reservations team are on hand to help you select one of our lovely family vacation rentals located close to Jermyn Street. We can also help with shopping, itineraries, tours, dining reservations, and customized private experiences. Contact us today for more information. Don’t forget our Christmas and New Year Sale on now. Read more about Jermyn Street in our blog post on Floris, the royal perfumer. All photos: 45 Jermyn St.
Posted on Thursday, November 16th, 2017 at 7:23 am in Food & Drink. You can follow any responses to this entry through the RSS 2.0 feed. You can leave a response, or trackback from your own site.